Mother Teresa was & is a true humanitarian! Always putting others need before & above all else! A role model to many who can learn to be selfless in a world where there is so much selfishness! Truly a Saint & Loved throughout the whole world! Thanks Nancy. I heard the other day that for 25 years Mother Theresa questioned herself the existence of GOD.25 years!But she never question her need to love loved and help those in pain........... Need to know where GOD was then? If only we could follow her example of selflessness. She was truly the best example of caring more for others than for ourselves. Thanks, an amazing person she was. You people who use this to advertise your junk for sale should be banned. Where are the moderators? One of my favorite people of all time. Truly inspirational. Talk about role models. I also read some time ago that she had many questions about God's existence from time to time. I imagine if we saw the pain and poverty she saw every day, we who believe might also have questions. I'm sure many of us ask, "Why?" and want to hear an answer when illness and other troubles enter our lives and the lives of others we don't even know. But she carried on - giving, loving, teaching - and the world is better for having had her presence here on earth. I love the way she wanted everything very simple - no fancy furniture or rugs, etc. She would throw them out or give them back. She always acted humble in her acts, always believing what she was doing made a difference, alleviated the pain of those who suffered. It did make a difference. It's too bad we as a world population either cannot learn the lesson she, in her very soft way, was teaching, or we can't make ourselves care for the needy as she cared. The whole world lost a remarkable humanitarian. I've always admired SOME of the work she did....but, in other ways, she was a dangerous woman. She told countless Indian women that their job was to have one baby after another! In a country like India, denying women the right to advice on controlling their fertility is just CRIMINAL. I will probably gain no friends for this, but I once also saw this woman as a saint.. but take a real look. She would not even give dying children a pain pill because they were dying anyway. She would hold their hands but no drugs were to be given as they died.. and she had millions at her disposal. Mother Teresa insisted that such suffering was beautiful as it evoked Christ's suffering, but when ill she took jets to visit exclusive, expensive hospitals. I am sorry to do this but it is not a secret... go and look... I guess part of my looking at her came from being a woman and Mother Teresa said , that we will never allow this country a single abortion. And no contraceptives.� She obviously saw no connection between poverty and too many children. One of Mother Teresa�s volunteers in Calcutta described her �Home for the Dying� as resembling photos of concentration camps such as Belsen. No chairs, just stretcher beds. Virtually no medical care or painkillers beyond aspirin. Do not believe me go and look.. 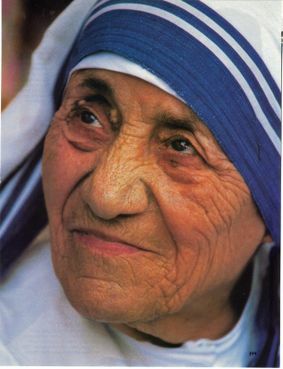 ..Mother Theresa was a purely ascended spirit that didn't need to come back....but she did because it was selfless caring that this world needed to learn about...not the selfish and spoiled of our world now. xo!